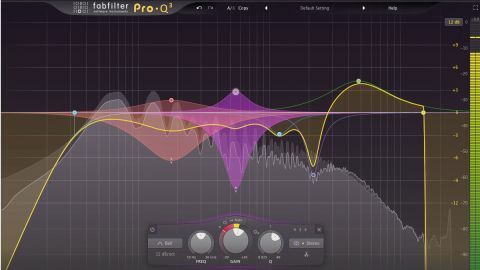 Pro-Q 2 was always going to take some beating but FabFilter have done it with plenty of significant and welcome additions. External Spectrum Visualization - address overlapping frequency content with ease. New Filter types and Brickwall modes for LPF and HPF. Dynamic EQ implementation could be a touch more clear. We’ve been fans of FabFilter’s plugins for as long as we can remember. Pro-Q 2 fought off stiff competition to become this reviewer’s go-to EQ and we’re equally fond of other FabFilter software. So it’s no surprise that we were excited to see what tools FabFilter might have integrated into the third iteration of its equalising plugin but also apprehensive; Pro-Q 2 balances ease of use, outstanding interface design and superb sound so delicately that we didn’t want to discover that Pro-Q 3 had pushed things too far to become clunky or over-complicated. Fortunately, the opposite is true, so let’s see what’s new. One of Pro-Q 2’s many great features was that if you let your mouse hover over the input waveform, it built a ‘summed’ picture of the active frequencies, letting you identify problems quickly. This window now provides ‘numbered tags’ of the loudest frequencies, so it’s even easier to see where nodes are gathering. You can grab one of these and immediately start making adjustments too, speeding up your workflow considerably. There are new filter types as well, with Tilt allowing you to instantly create linear slopes from one frequency extreme to the other (bass attenuation matched to treble lift, for instance), while Brickwall produces more extreme filtering than ever, allowing a ‘complete’ volume drop option for the high and low-pass filters. Pro-Q 3 introduces surround sound processing for the first time, supporting multichannel mixes. However, perhaps the two biggest developments are the inclusion of ‘External Spectrum Visualization’ and ‘Dynamic EQ’ mode. If you’re familiar with iZotope’s Neutron, you’ll know all about the former. This feature allows you to superimpose the frequency footprint of any instance of Pro-Q 3 over another, so you can see where frequencies conflict enough to cause problems. The most common use of this would be to see where kick drum and bassline frequencies might be at war but this feature is welcome in other tone areas too. It’s neatly represented, with ‘red’ shading on the waveform indicating frequencies you’d be wise to address. Dynamic EQ mode allows you to create frequency nodes which respond dynamically to the input level of a signal, so that more attenuation is applied as the input signal gets louder. This is hugely welcome as it’s so flexible a tool but my only tiny gripe is that, by FabFilter’s standards, dialing in the amount of dynamic reduction you want isn’t as easy as it might be; a pop-out, larger display to adjust this dial once you instantiate it would be welcome. Another notable new feature is per-band mid/side or left/right processing. Suddenly, you’ll find you can apply tone change to mid, side, left and right signals for each band independently. Pro-Q 3 is a wonderful update to an (arguably) already class-leading equaliser. The best just got better.